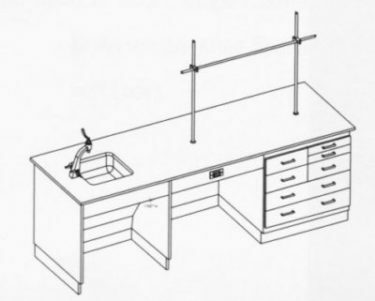 This Instructor Desk allows laboratory demonstration to accompany storage and organization in one location. This particular unit is completely handicap accessible, with a knee space and ADA compliant fixture. Electrical capability and a chemical resistant top and sink are additional features that enhance the versatility of this desk. 96″ L. X 31″ W. X 34″ H. Overall.